Background: A large number of children die due to pneumonia making it the single largest infectious cause of death more than AIDS, measles, and malaria combined. In India, acute respiratory infection is a major public health problem, especially for the age group of 0–5 years which contributes to 15–30% of deaths falling under this age group and most of these deaths are preventable. Objective: To assess the level of knowledge and perception regarding childhood pneumonia among mothers of under-five children. Materials and Methods: A cross-sectional study was conducted among 460 mothers of under-five children. Interviewer-administered structured questionnaire was used for data collection and the sampling technique used was three-stage cluster sampling. The questionnaire was divided into three sections as socio-demographic profile, level of knowledge, and level of perception. Results: The study found that mothers were predominantly secondary school graduates (32.6%) out of which, 93.7% were homemakers, 41.3% mothers had fair knowledge, and 41.5% had fair perception about pneumonia. Age and education level of mothers had a significant association with the knowledge as well as with perception. There was a significant association between level of knowledge and perception of childhood pneumonia among these mothers. Conclusion: Overall, mothers had fair knowledge and fair perception of childhood pneumonia. The lack of knowledge about simple signs and symptoms and factors related to pneumonia needs to be addressed. Pneumonia is the acute infection of lower respiratory tract that mostly affects the lungs. In pneumonia, the alveoli of the lungs fill up with pus or fluid as such leads to difficulty in breathing. And, as such gaseous exchange does not occur like in normal condition. A large number of children die due to pneumonia making it the single largest infectious cause of death even more than AIDS, measles, and malaria combined. In the year 2013, pneumonia killed about a million children in the age group of 0–5, about 15% of deaths of children under 5 years old was due to pneumonia. In India, acute respiratory infection (ARI) is a major public health problem, especially for the age group of 0–5 years which contributes to 15–30% of all deaths falling under this age group and most of these deaths are preventable. The symptoms present in pneumonia are very similar to that of common cold and fever and as such 20% of mothers cannot recognize it. In developing countries, only about 1/5th of caregivers recognize the symptoms associated with pneumonia properly. Even if they recognize it, the health care facilities are very hard to reach in these areas, as such rural and poor children have enhanced likelihood of dying before the age of five compared to their urban and rich counterparts. Pneumonia mainly occurs among people living in poverty. It is affected by various factors such as poor home environment, lack of nutrition, and health services. Deaths that are caused are preventable along with exclusive breastfeeding practices and proper nutrition. Apart from these, vaccinations and hand-washing with water and soap, hygienic drinking water, and good sanitation also minimize the onset of pneumonia to a great extent. The integrated Global Action Plan for pneumonia and diarrhea has been trying to eliminate preventable pneumonia and diarrhea deaths and has set a goal of doing so by 2025. To do so, they have opted to promote proper access to proven prevention and treatment methods for children. Highlights from the regional evaluation report (2011–2012) of Karnataka by Ministry of Health and Family Welfare (MOHFW), Government of India, reported that 29 out of 40 mothers (72.6%) had no knowledge on danger signs of ARI in Udupi district. Despite substantial progress, India is still failing to achieve Millennium Development Goal child mortality target. The inability to recognize common illnesses of an infant, such as pneumonia by mothers, can result in thousands of avoidable deaths. The present study aims to understand the mothers' level of knowledge and perception regarding childhood pneumonia among mothers of under-five children and to see the association with sociodemographics. Various studies have been done regarding prevalence and risk factor associated with ARI whereas there are only limited studies in India on perception and knowledge of mothers for pneumonia. Knowledge and perception of pneumonia among mothers is very essential to improve the early detection of childhood pneumonia and prevent the delay in health-seeking behavior and thereby preventing its progression to severe or fatal stages. Therefore, this study can be taken as an evidence for better planning of the strategies to create awareness among rural parents in the community. 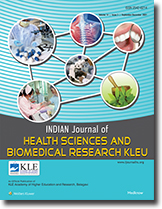 In January 2015, a cross-sectional study was conducted among the mothers residing in the rural areas of Udupi taluk, Karnataka, India. The study was carried out from January 2015 to June 2015 after obtaining the IEC approval. To carry out the epidemiological survey, a structured questionnaire was used covering 8 factors such as simple signs and symptoms, assessment, prevention, causes and factors, perceived susceptibility, barriers, benefits, and severity related to pneumonia. Data were collected by the principal investigator using a standardized questionnaire consulting the statistician. Questionnaire consisted of three parts, demographics, and twenty questions on knowledge and perception each. For the correct answer, score was assigned as 1 and 0 was assigned for incorrect and not sure. Total score for knowledge and perception was 20 each. Total score was then categorized as good (15–20), fair (10–14), and poor (<10). A sample size of 460 mothers of under-fives was calculated based on the results of the survey conducted by MOHFW in 2011–2012 regarding the prevalence of knowledge of danger signs of pneumonia among rural women of Udupi district. Three stage cluster sampling technique was employed. Using lottery method of the simple random sampling technique, 6 Primary Health Centers (PHCs) were selected out of a total of 23. There were 40 villages in the selected PHCs, out of which, 16 were selected using the same technique. In each selected village, using systematic random sampling technique, 30 mothers were selected to be a part of the study. The survey covered 460 mothers of under-fives, who were willing to participate. Univariate analysis was used to ensure the association, using the software package SPSS Inc., Southeast Asia, Bangalore. Chi-square test and Fisher's exact test were used, wherever applicable. Among 460 mothers who were interviewed for the study, majority of them (45.4%) were in the age group of 25–31 years. In the study, 32.6% (150) mothers had secondary education and 87% of them were homemakers. 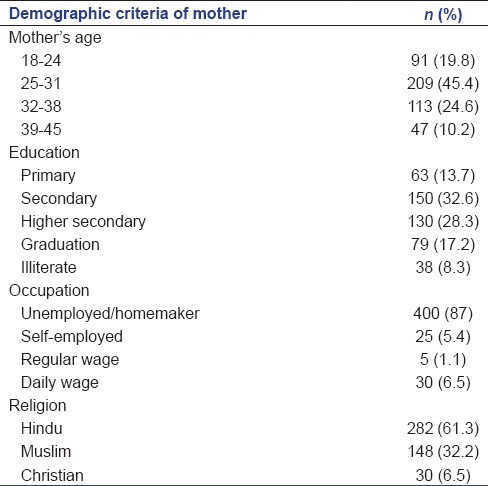 Most of the mothers were Hindus as shown in [Table 1]. About 41.3% of the mothers had a fair knowledge of the signs and symptoms of childhood pneumonia and 41.5% of the mothers had a fair perception of childhood pneumonia. In the present study, association between sociodemographic variables and knowledge and perception of childhood pneumonia was analyzed. It was seen that there was an increase in the knowledge of childhood pneumonia as the mothers' age increased and this was found to be significant (P < 0.001) as shown in [Table 2]. The increase in the level of the mothers' education was significantly associated with the increase in the knowledge of childhood pneumonia among mothers (P < 0.001). The study showed that there was no significant association between religion of the mother and her knowledge on childhood pneumonia. Similarly, age of the mother and education status were found to be significantly associated with the mothers' perception of childhood pneumonia (P < 0.001) as shown in [Table 3], whereas religion was not found to be significantly associated (P = 0.0856). However, there was a significant association between knowledge of childhood pneumonia and its perception among the mothers in the study (P < 0.001) as shown in [Table 4]. In India, ARI is a major public health problem, especially for the age group of 0–5 years. ARI contributes to 15–30% of all deaths falling under this age group. Highlights from the regional evaluation report of Karnataka by MOHFW, Government of India (2011–2012), reported that 72.6% of mothers of under-five children had no knowledge on danger signs of ARI in Udupi district. The present study found that out of 460 mothers interviewed, 41.3% were found to have fair knowledge, 31.5% had good knowledge, and 27.2% had poor knowledge. Similar study was conducted by Siswanto et al. in 2007 in Thailand among 140 mothers' of under-five children and was found that 66% had fair knowledge, 19% had good knowledge, and 15% had poor knowledge. A study conducted by Abusaad et al. in 2014 at Saudi Arabia among 160 mothers' of under-five children found that 64.3% had fair perception of childhood pneumonia while 20.7% had good perception and 15% had poor perception. The current study found that 41.5% had fair perception, 33% had good perception, and 25.4% had poor perception. In the present study, significant association was found between mothers' age and level of knowledge. This finding is supported by a study which was conducted by Farhad et al. in 2014 in Iran, where it was found that mothers' age and level of knowledge were significantly associated. The current study showed significant association between education status of mothers and level of knowledge. This finding is supported by a study conducted by Ekure et al. in 2013 in Nigeria which found that the mothers' educational status and level of knowledge are significantly associated. Whereas the study conducted by Farhad et al. in 2014 in Iran, it was found that there was no significant correlation between educational status and level of knowledge, which is contradicting to the present study. Significant association was found between mothers' perception and maternal education in the present study. This finding is supported by a study conducted by Memon et al. in 2013, which found that mothers perception and maternal education status were significantly associated. A study conducted at Nakhon Pathom General Hospital by Siswanto et al. in 2007 in Thailand found no significant association between level of knowledge and level of perception. In contrary to this, the current study showed significant association between mothers' level of perception and level of knowledge of childhood pneumonia. It was found that overall mothers had fair knowledge and fair perception of childhood pneumonia. Significant association was found between maternal age and levels of knowledge and perception and also between level of education and levels of knowledge and perception of childhood pneumonia. No significant association was found between religion and levels of knowledge and perception. The current study shows the relation of social factors to knowledge and perception of childhood pneumonia among mothers of under-five children which can contribute toward prevention of morbidity and mortality due to pneumonia among these children. More efforts can be made to bring awareness among these mothers regarding the importance of clinical care in case of pneumonia among these children. We would like to thank Dr. Prakash Narayan (Associate Professor, Department of Public Health) for valuable contribution and inculcating critical thinking. We would also like to acknowledge the ASHAs, Mrs. Mohini, and Mrs. Geeta for their help and support during my data collection. We owe our sincere gratitude to District Health Officer, Udupi, for providing permission to visit respective PHCs to get the list of villages under those PHCs. Pneumonia. Media Center World Health Organization; 2014. Available from: http://www.who.int/mediacentre/factsheets/fs331/en/. [Last retrieved on 2014 Dec 08]. Focus on Pneumonia, World Health Organization; 2014. Available from: http://www.wpro.who.int/philippines/typhoon_haiyan/media/Pneumonia.pdf?ua = 1. [Last retrieved on 2014 Dec 08]. Lal S. Epidemiology of communicable diseases and related National Health Programmes. Textbook of Community Medicine. 23rd ed. Park's Textbook of Preventive and Social Medicine; 2011. UNICEF. The State of the World's Children 2008: Child Survival www.unicef.org/sowc08/docs/sowc08.pdf: UNICEF; 2008. UNICEF. “UNICEF - Health - Pneumonia”. N.p., 2016. Web. Available from: http://www.unicef.org/health/index_43828.html. [Last retrieved on 2016 Jan 23]. UNICEF. Committing to Child Survival: A Promise Renewed; 2012 Available from:http//www.unicef.org/ethopia/APR_Progress_Report_2012_final.pdf. [Last retrieved on 2014 Dec 14]. Highlights from the Reports of the Regional Evaluation Teams 2011-2012, Ministry of Health and Family Welfare (2011-2012), India. Available from: https://www.nrhm-mis.in/. [Last cited on 2014 Dec 15]. Siswanto E, Bhuiyan SU, Chompikul J. Knowledge and perception of pneumonia disease among mothers of children under five years attending Nakhon Pathom general hospital, Thailand. J Public Health Dev 2007;5:43-54. Abusaad SF, Hashem FS. Mothers learning needs assessment regarding pneumonia among children less than five years at Saudi Arabia. Int Res J 2014;3:85-93. Farhad J, Malihe A, Fatemeh A, Mahmood S. The knowledge, attitude and practice of mothers regarding acute respiratory infections in children, Iran. Biosciences Biotechnology Research Asia 2014; 11:343-8. Ekure EN, Esezobor CI, Balogun MR, Mukhtar-Yola M, Ojo OO, Emodi JJ, et al. Mothers and childhood pneumonia: What should the focus of public campaign be?. Niger J paed 2013;40:24-9. Memon NK, Shaikh K, Pandhiani SB, Usman G. How do mothers recognize and treat pneumonia in their children at home? A study in union council Jhudo, district Mirpur Khas. J Liaquat Univ Med Health Sci 2013;12:208-13.